A trip to the beach always offers the ultimate romantic getaway. Myrtle beach is no exception – with great options in dining and nightlife, you won’t have to rely on a simple walk along the shore to keep the spark on your trip. If you move away from the coastline, you will find one of the Myrtle Beach area’s proudest spots, and the ‘Seafood Capital’ of South Carolina, Murrell’s Inlet. 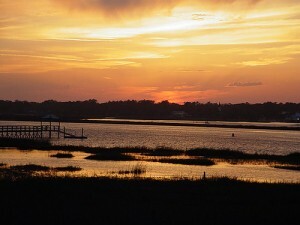 The inlet, located in South Carolina’s Low Country, is a salt water marsh that is part of a rich fishing tradition in the area. One gem along this marsh is the GulfStream Cafe, an upscale seafood restaurant that looks out over the creek. Enjoy a beautiful sunset on the deck or upstairs bar, and then indulge in some delicious, fresh seafood in from the highly-rated restaurant. The restaurant serves everything from lobster, crab, steak and other fresh fish such as grouper, popular in the southern states. They also have an excellent She-Crab soup, a local favorite. The menu is pricey, the average fresh seafood entree runs about $20… but can you really but a price on excellent food and ambiance? After dinner, you can hop over to the other side of the marsh for drinks and music. The Murrell’s Inlet ‘Marshwalk’ – the creek’s version of the ever-popular Boardwalk, offers several bars with open decks so you can pop in and out as you please. And they are happy to serve drinks in cups so you can walk outside of the establishment to take in a beautiful sunset or stary evening. Many of the establishments, such as the Dead Dog Saloon, offer live music on their decks as well. Your perfect date doesn’t have to end with drinks (unless, of course, you want it to!). All couples will tell you the key to a successful relationship is laughter. Well, at the Uptown Theater, you will find no lack of laughs. Run by the Carolina Improv Company, The Uptown Theater usually puts on improv shows 3 nights a week, similar to the popular show, Whose Line Is It Anyways?, but their version, Whose Beach Is It Anyways? 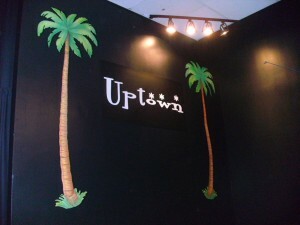 is performed by locals, focusing their comedic routines on the Myrtle Beach area. The theater is located in a local mall, but don’t be fooled, this intimate little theater performs to packed audiences. Tickets for a show are $10, and there is a small bar where you can purchase wine or beer for at an additional cost. The theater also hosts musicians and other performances as well. Here is a clip of a June performance of Whose Beach Is It Anyways? yo guys and girls i cannot wait 4 the expendables to come out! Its going to be awsum!